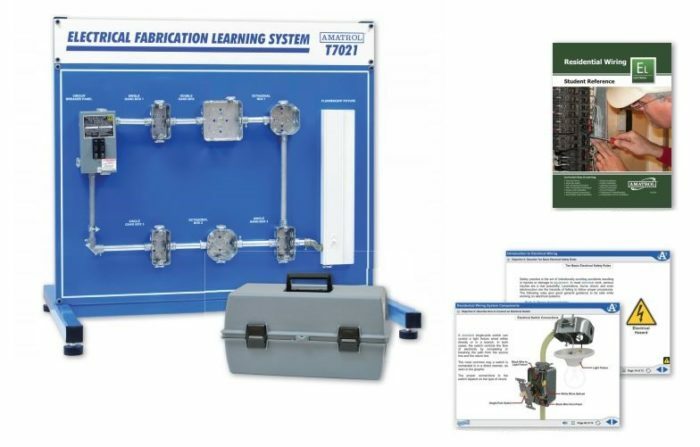 Amatrol’s Electrical Fabrication 1 Learning System teaches students skills that are commonly used by electricians, technicians, and engineers in today’s industry. Installing, operating, repairing, or designing equipment for modern industry requires fundamental knowledge of electrical wiring and components. Students will gain expertise in key skill areas such as basic electrical system wiring, interpreting wire installation plans, handling non-metallic cable, installing basic components such as switches, outlets, and lighting, and connecting electrical services. The model 950-ELF1 includes a workstation, wiring components, storage case, hand tool package, electrical consumable package, electrical accessories, multimedia student curriculum, instructor’s assessment guide, and installation guide. The 950-ELF1 covers industry-relevant essential electrical fabrication skills. These skill areas include test checking with a voltage tester, checking electrical components for UL and CSA standards approval, stripping insulation from wires, installing spade-lug connectors, connecting wires to a terminal strip, reading and interpreting a wiring installation plan, and safely and properly installing electrical wiring, lighting, and components. The 950-ELF1 not only teaches students proper installation of electrical wiring and components but also the importance of safe installation. Student curriculum emphasizes basic safety rules as well as the National Electrical Code (NEC) and other safety approval ratings. Students develop skills to identify and work with components that are marked with these safety ratings. Students also learn about and apply circuit protection and how to properly operate, install, and test circuit breakers.